resulting from the radiative transfer (5) with realistic opacities. Granulation pattern in the emergent intensity of the Sun, observed with the Swedish Solar Telescope (left; resolution is 25 km) and the numerical simulation (right). At the optical surface, radiative cooling leads to large-amplitude entropy fluctuations, which is associated with temperature and density fluctuations, leading to buoyancy and thereby essentially driving convection. The result is a typical granulation pattern, which is observed on the surface of the Sun (see right Figure). As illustrated below, hot, under-dense upflows in the bulk granules are interspersed with cold, over-dense downdrafts in the turbulent intergranular lane, forming plume-like structure in the convection zone (see Nordlund & Stein 2009). In the following, the temporal evolution of different properties from surface convection simulations for different stars are presented below. The emergent bolometric intensity is shown (red-orange) in the left panel, while in the middle panel vertical slices of the temperatures (red-orange) are given. In the right panels horizontal slices of the temperature (red-orange) and density (blue) are depicted. The height of the XY slice is marked in the panels with the vertical slices. The optical surface, i.e. the layer of constant optical depth of unity, from the solar simulation is shown from above. Furthermore, the vertical velocity is shown with upflows in blue and downflows in red. The optical surface is corrugated, since in the cooler intergranular lane, the optical depth of unity is shifted towards lower geometrical height due to lower pressure scale height. The temperature fluctuations of the solar simulation are illustrated from above and below the optical surface (top and bottom video, respectively). Hot regions are orange, while cool regions are blue. The density fluctuations of the solar simulation are illustrated from below the optical surface. Under-dense regions are blue, while over-dense regions are red. The vorticity of the solar simulation is shown from above and below the optical surface (top and bottom video, respectively). High-vorticity regions are marked with purple. The Mach-number in the solar simulation is shown from above the optical surface. The transsonic regions are marked with blue. 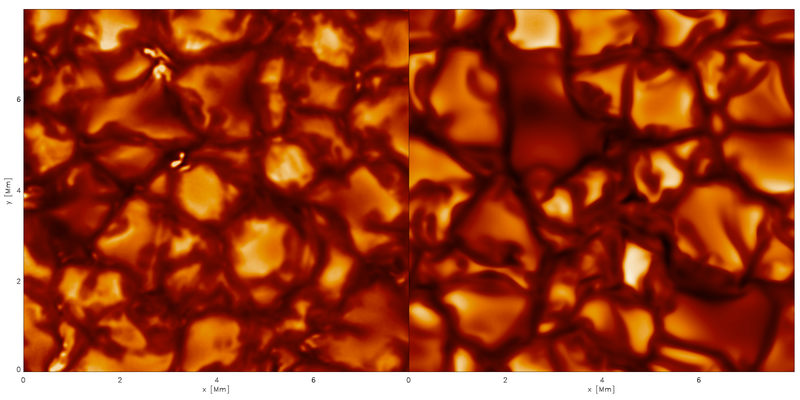 The optical surface from the red-giant simulation is shown from above. Furthermore, the vertical velocity is shown with upflows in blue and downflows in red. The Mach-number in the red-giant simulation is shown from above the optical surface. The supersonic regions are marked with blue. The optical surface from the turn-off star simulation is shown from above. Furthermore, the vertical velocity is shown with upflows in blue and downflows in red. The Mach-number in the turn-off star simulation is shown from above the optical surface. The supersonic regions are marked with blue. The optical surface from the red-dwarf star simulation is shown from above. Furthermore, the vertical velocity is shown with upflows in blue and downflows in red.